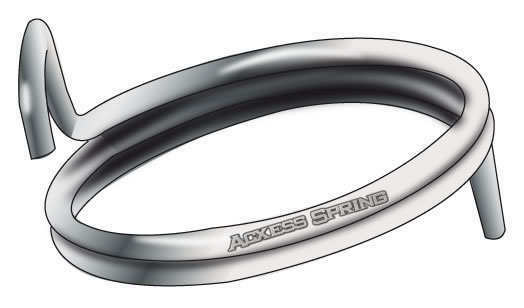 Compression springs are our most basic spring at Acxess Spring. We manufacture compression springs from 0.006 inch wire diameter to 1.00 inch wire diameter. However, there are a variety of custom features you can add to your compression spring. Each of these custom features can be used for specific requirements in a design. For example a customer may want ground ends if the spring needs to sit flush against a surface. Another example may be variable pitch, this will allow the spring to produce more force at certain distances of travel and less at others. The last example used above is stacked coils, this may be beneficial if the spring needs to thread onto a bolt or over a shaft to give the spring stability. There are also other springs, which are types of custom compression springs, that are manufactured at Acxess Spring. These springs include conical springs, barrel springs, and magazine springs. Conical springs are almost exclusively a custom part. With a multitude of different shapes and taper angles the possibilites are very wide for this type of spring. Conical springs are very helpful in a product, especially when you are looking to save space in a design. Since conical springs can telescope, meaning the smaller coils can fit inside the larger ones, the solid height of the spring can be greatly reduced. You can see to the right some examples of the conical springs we manufacture. We manufacture conical springs from 0.006 inch wire diameter to 0.100 inch wire diameter. If you are looking for a spring out of larger wire we would be happy to take a look at in on a case by case basis to see if it is something we can manufacture. 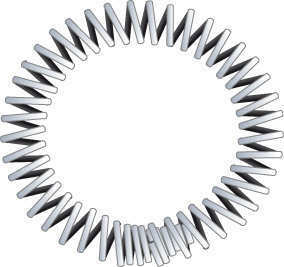 Another type of compression spring that is customized by shape is a barrel spring. A barrel spring is different from a conical spring because instead of having a larger coil and working your way down a barrel spring will have two end coils of the same diameter that are smaller than the outer diameter of the middle coils. This can be helpful for a solid height reduction the same way that conical springs can be. One of the main reasons for choosing a barrel spring is to prevent the compression spring buckling, meaning as the spring compresses the middle of the spring would buckle out preventing the spring from traveling any more. Some examples of a barrel spring can be seen on the images to the right. We manufacture barrel springs from 0.006 inch wire diameter to 0.100 inch wire diameter. We can look at springs over a 0.100 inch wire diameter on a case by case basis. Magazine springs are a custom compression spring used in the magazine of a gun. Instead of the stock custom spring shape the magazine springs will have an oval shape instead of the standard circular shape. 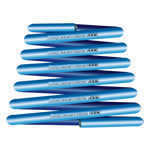 This gives the magazine spring two outer diameters, the outer diameter of the width and the outer diameter of the height. 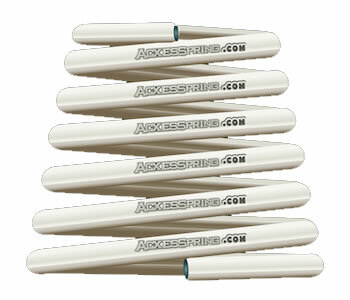 Acxess Spring manufactures magazine springs from 0.015 inch wire diameter to 0.100 inch wire diameter. Extension springs are another type of spring that Acxess Spring manufactures in both the stock and customer areas. We manufacture extension springs from 0.006 inch wire diameter to 1.000 inch wire diameter. Stock extension springs will have simple machine or cross-over hook ends where as custom extension springs work differently. You can see a few examples of custom extension springs to the right. Please remember the more custom features you add to a spring, the more expensive that spring becomes to manufacture. Make sure all custom elements you are adding to your spring are necessary for the functionality of your design. Torsion springs are probably the most customizable of all spring types. With a multitude of free position angles, bend types, and bend angles the possibilities are endless. 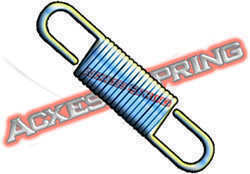 Torsion springs are normally used as a hinge spring or a lever spring. They are most effective at returning a device to its original position after force has been applied. For example if you have any product where a door opens when pressure is applied and closes when pressure is released you are most likely using a torsion spring. Acxess Spring manufactures torsion springs from 0.006 inch wire diameter to 1.000 inch wire diameter. Some examples of the torsion springs we manufacture can be seen in the images to the right. Double torsion springs are an example of a custom feature available for torsion springs. Double torsion springs serve the same function as torsion spring but are used for instances where a different amount of force is required that cannot be achieved by using a single torsion spring. The most common example of a double torsion spring is a mouse trap. We manufacture double torsion springs from 0.010 wire diameter to 0.100 inch wire diameter. To see an example of a double torsion spring please see the image to the right. Garter springs are another product that Acxess Spring manufactures that are specifically custom. 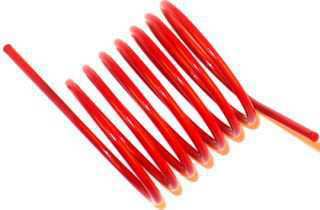 Garter springs are mostly used as seals inside a urethane or rubber product. They can also be used to produce a radial force opposed to a linear (push/pull) force. For example when a garter spring is fitted around a product and the product expands, the spring will produce a force in opposition to the expansion causing it to return to its original state. 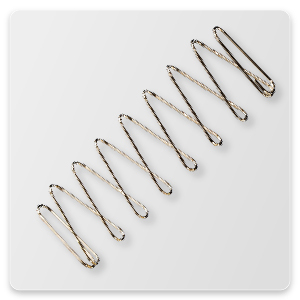 Acxess Spring manufactures garter springs from 0.006 inch wire diameter to 0.100 inch wire diameter.